Named after the royal Nizams of Hyderabad, this curry boasts of rich ingredients like cashew nuts, almonds and cardamom. 2 In a deep pan, heat 2 tbsp. vegetable oil, add cumin seeds and cardamom pods allow it to splutter, add whole red chilies. 3 Add chopped onion and fry till golden brown. 4 Add chopped tomatoes, 1/2 tbsp. ginger garlic paste, coriander powder, red chili powder, turmeric powder and salt. 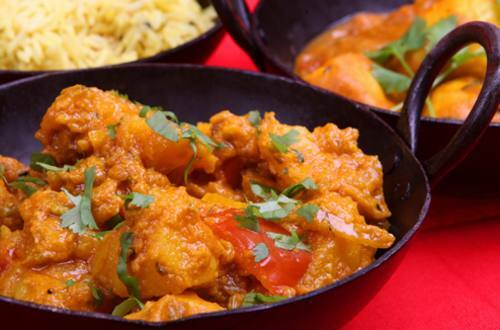 5 Add pre-cut chicken into the onion tomato masala, cashew nut paste and cook for 15 minutes. 7 Garnish with coriander leaves, chopped toasted almonds and mint leaves.